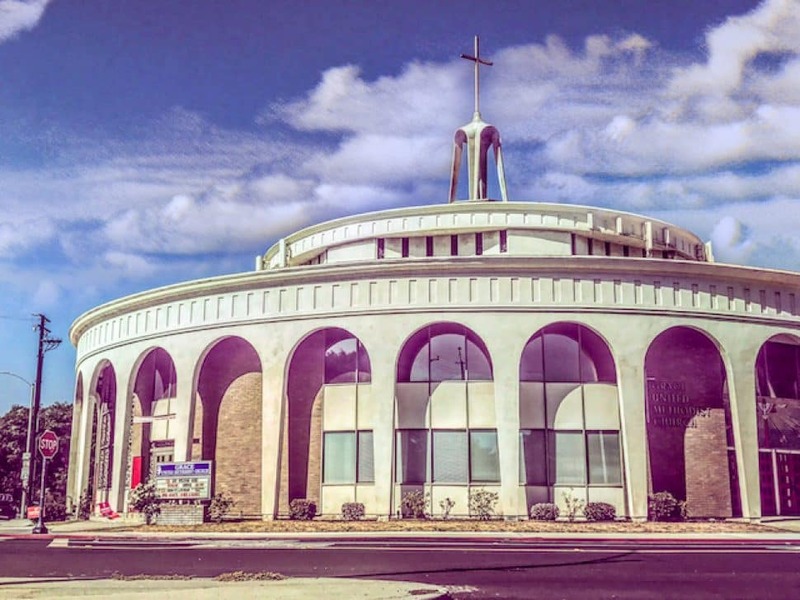 St. Anthony's Catholic Church in Downtown Long Beach. Photo by Brian Addison. Churches, despite their complicated history, have been one of the largest employers of artists and architects—not just because they believed some of these creatively inclined men and women were touched by God, but because churches were believed to be direct extensions of God. 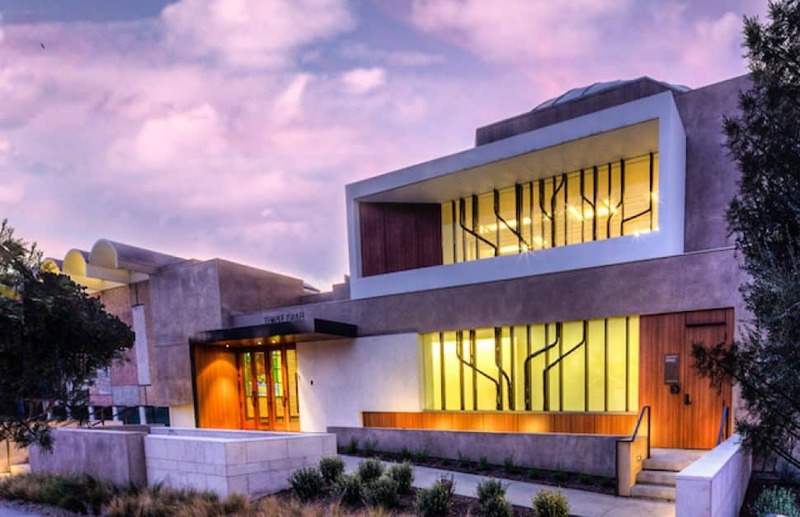 The Catholic Church has been one of the world’s largest employers of architects, having garnered work from everyone from Richard Meier to Rafael Moneo to Trey Trahan. Denmark’s Church of the Holy Cross brought on KHR Architects. Guðjón Samúelsson’s masterpiece in Iceland, the Church of Hallgrímur. Finland’s Chapel of St. Lawerence brought on Avanto Architects for its chapel in the snow. 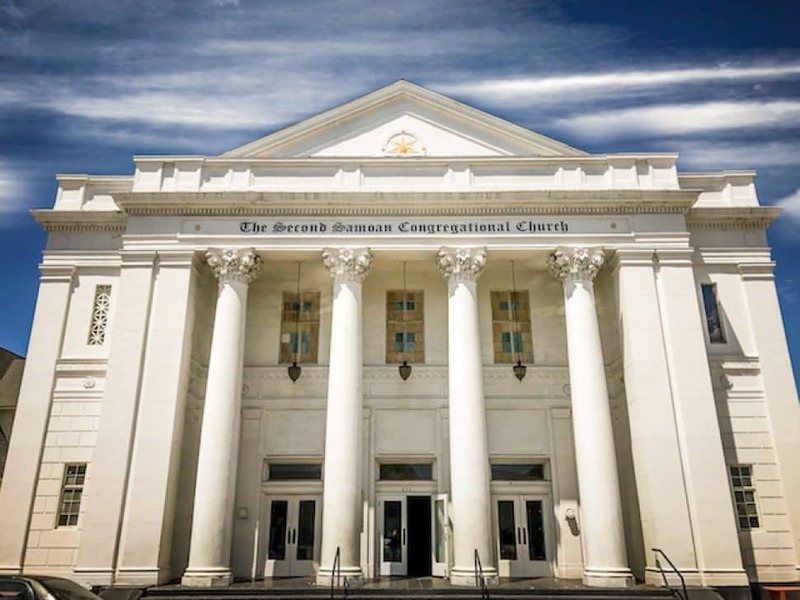 Despite one’s faith, or lack thereof, these pieces of creation connect us all through the thread of human imagination and talent—and Long Beach is home to some captivating houses of worship. The bell tower of First Congregational Church in Downtown Long Beach. Photo by Brian Addison. Built in 1914 and one of the city’s oldest surviving churches, this prime example of Italian Romanesque architecture has always stood out for me with its tower. 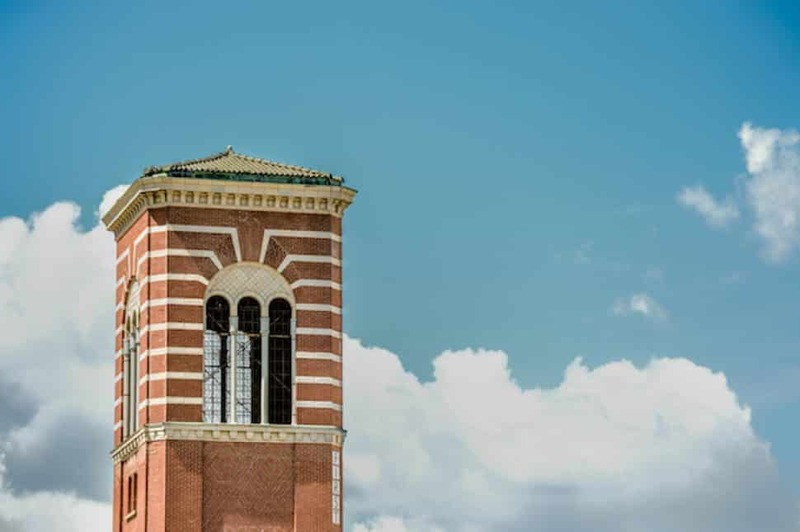 Yes, there are a plethora of other features: the red brick, the terra cotta details that include massive rosettas … All designed by H.M. Patterson, a Los Angeles-based architect, and built to perfection by Long Beach-based construction manager C.T. McGrew. But the tower is a shining example of the kind of details that would eventually usher in modernism: Straight white lines act as the precursor to the modernists’ obsession with latitude and—if one to were to remove the ornate details of the arches and roof—would be a prime example of minimalism. Of course, there is nothing minimalist nor really modern about the building as a whole but it offers some spectacular beauty either way. The Second Samoan Congregational Church in Downtown Long Beach. Photo by Brian Addison. Originally the Second of Church of Christ, this historical landmark in DTLB is a dedication to the Renaissance Revival style complete with a Roman Temple facade and large dome. This church was designed by Pasadena-based artist and architect Elmer Gray, the man behind the Huntington Art Gallery and the Wattles Mansion. Gray’s philosophy was fascinating: he believed his creations were at one with the “natural climate” surrounding it—but in all honesty, it is clear that his style looks to supersede its surroundings while simultaneously blending with them. By today’s standards, this church, now surrounded by secular structures, still stands as a testament to a long-lost style of architecture. Temple Israel in Belmont Heights. Photo by Brian Addison. Hidden in Belmont Heights, this Jewish temple is not only one of the most unique houses of worship but one of the most unique buildings in all of Long Beach. Originally built in 1945, you can see that its overall mid-century modern style was also catering to some Googie elements. Grace Methodist Church at 3rd and Junipero in Long Beach. Photo by Brian Addison. Grace Methodist Church at Third and Junipero has a history tinged with disaster: Originally built in 1906, with a wooden structure added in 1913, both burned to the ground in 1964 due to arson. Out of this tragedy came, at the time, one of the most unusual features for any form of architecture, let alone a church: a circular gem designed by Palmer W. Power, a man known for his monolithic, religious gems—and in this case, breaking entirely away from the typical architecture of churches and using the circular piece of real estate to his advantage. A wonderful mix of mid-century modern trying to interpret Italian Romanesque style with its brick and arches, filling those arches with 136 stained glass designs to create a gorgeously colorful interior when the sun hits its walls. Perhaps, more than the architecture of the Grace Methodist Church, I should end on the purpose of this particular church. You see, this is a church of many churches. It hosts LGBTQ Christians. It hosts weddings of various faiths. It hosts various cultures. I suppose the ultimate point of this particular church is that it is not a particular church, and for me, even as an atheist, that is quite powerful.